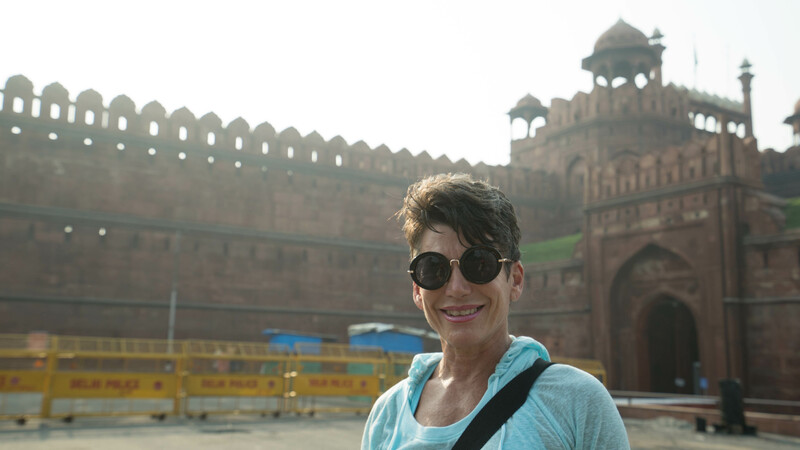 We left the Lalit early, checking out, and drove to the Red Fort to get there early before the crowds, and the heat, settled in. 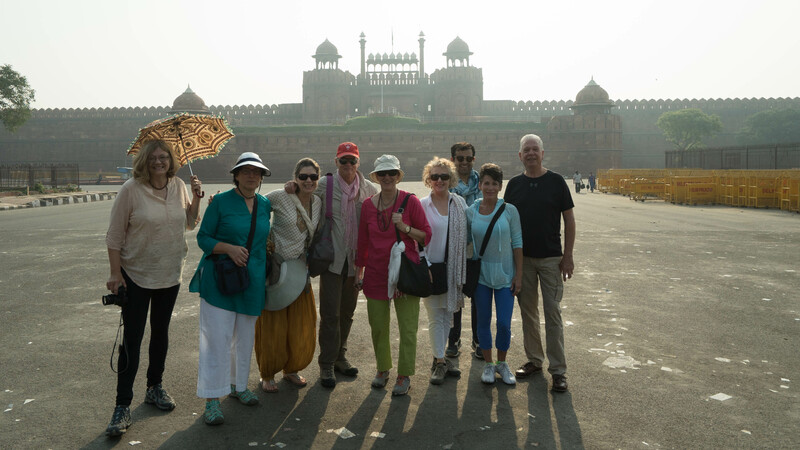 We had a guide who was terrific, and explained the history and the workings of the Fort during the Mughal Empire, and later when the Raj took over. We then walked to the Jama Mosque, the biggest mosque in Delhi, and one of the biggest in India. 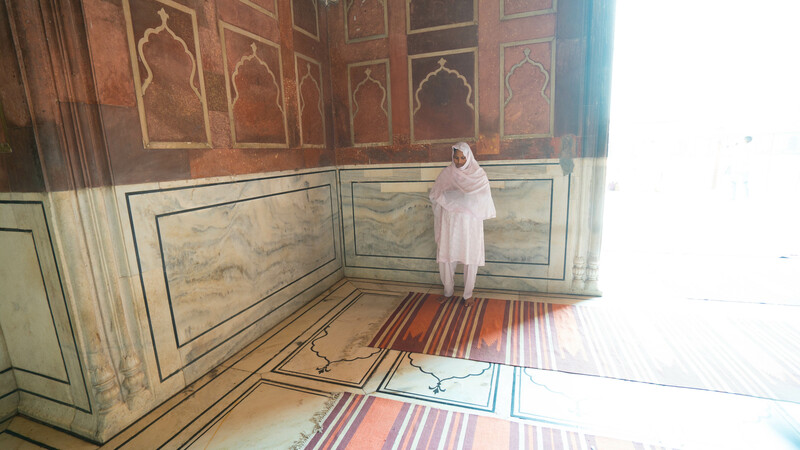 I sat under the crystal chandelier in the centre of the mosque, and meditated. 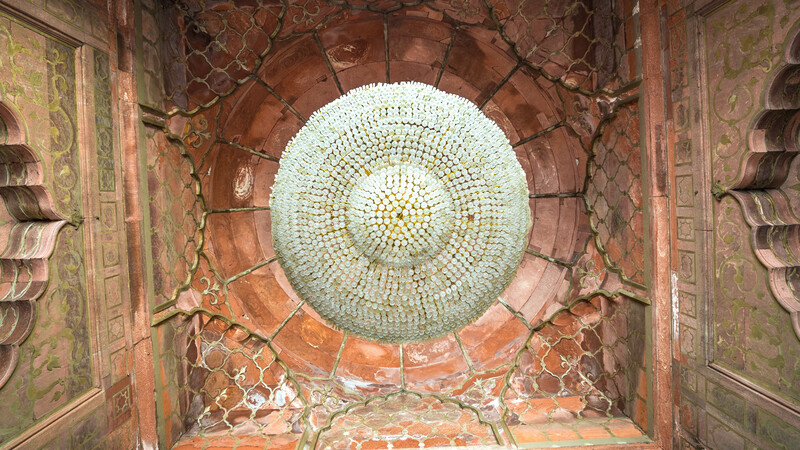 The cosmic energies are meant to come down through a massive dome, which was above me – and certainly it was a most potent place to be. 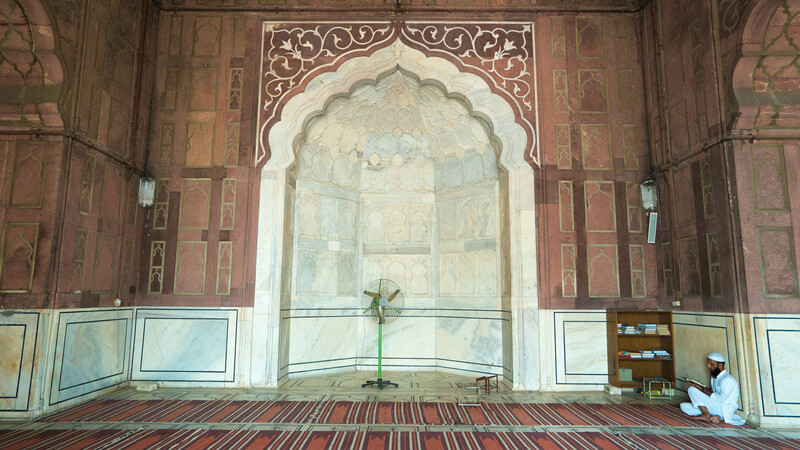 The worshippers sat quietly and read from the Qur’an, or prayed. 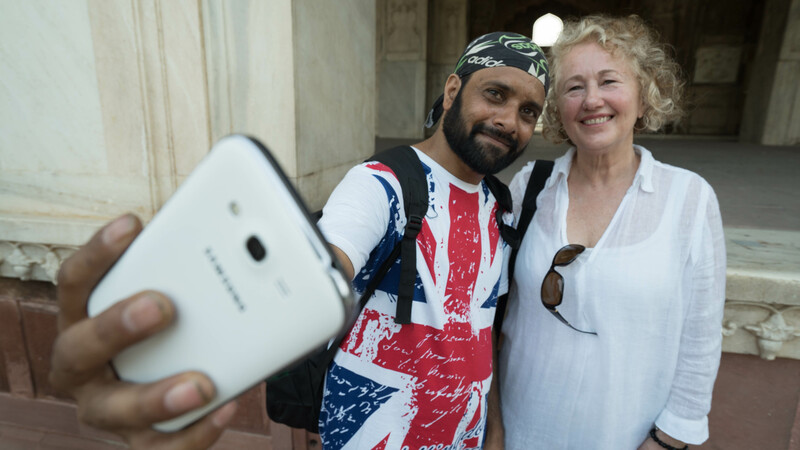 We had a glorious lunch in a beautiful restaurant in Noida – then hopped on our bus and drove along the expressway to Agra. 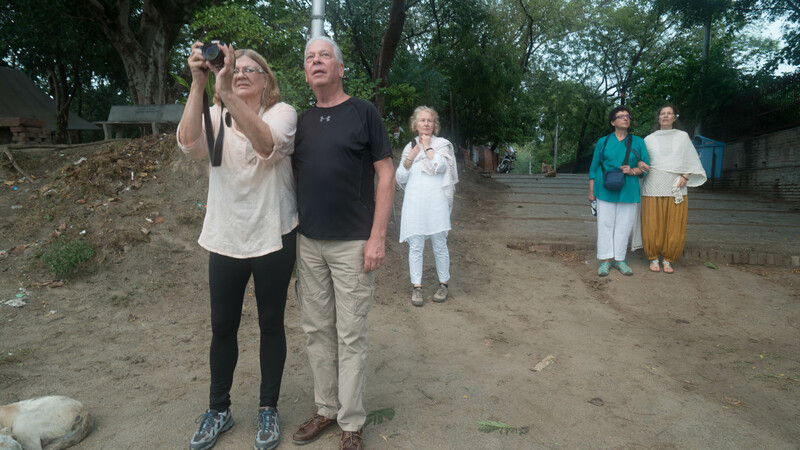 We got there just on dusk, and drove to the Moonlight Gardens across the Yumana River, with a view to the rear of the Taj Mahal. Even at a distance it was breathtaking. Tomorrow we’re getting up early to visit the Taj at sunrise. Fabulous – simply breathtaking! A big hello and hug to everyone. Arlene – sorry for the late reply. It’s been really hectic – but thanks for following us and posting comments. So lovely to hear from you! All looking FABULOUS, PGS family! Wish you were with us Camino Angel!! Atma Namaste, Bill. While you’re all soaking in the exquisite fragrances, colors, history and profound cultural nuances of India, Raphaelle and I just arrived in Burlington, Vermont, on the shores of Lake Champlain, feasting on Japanese food, Vermont cheese and apples, the world renown fall foliage and a gorgeous sunset over the lake! 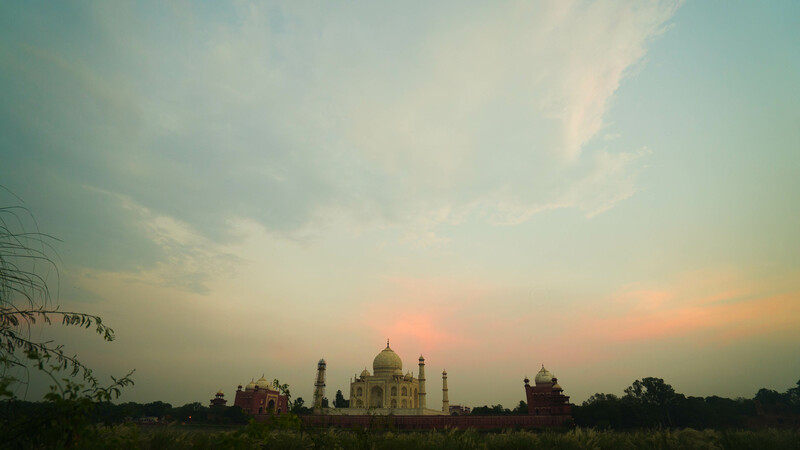 I didn’t make it to the Taj on my India pilgrimmage, but I’ve heard that its extraordinary. I’m happy that you and your band of merrymakers are getting to have an incredible experience. Great photos all the way around. The one of Jennifer turning toward you captures an inner child-like joy bubbling up to the forefront. Lots of light. I love most the pictures that reflect the essence of a person. Hi Kathryn – sorry for the delay but your email got caught in my spam folder for some reason. Anyway, it must be a bit of a culture shock to come back to your home after that time away. But it seems like it was a very successful time in Bali for you both. And for your family too! You must have been Indonesian in past lives, you guys… ! !